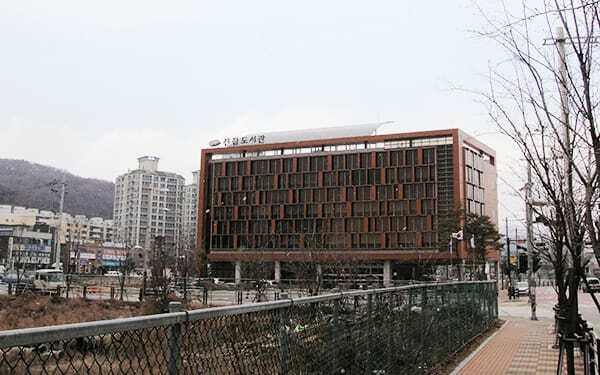 Two Apogee Instruments SP-110 Silicon-cell Pyranometers have been integrated by Daeyeon CNI as part of a PV monitoring system at the Jin Jeop library located in Namyangju city, Gyunggido, Korea. The library has a PV power generation facility on the roof of the building that is converting DC voltage to AC voltage and supplying power to the building for electric lamps, air conditioning, and water heaters. The two SP-110 pyranometers are mounted to the side of the PV panels. One pyranometer is mounted horizontal to measure the global solar irradiance, and the other is mounted tilted in the plane-of-array to measure global tilted irradiance or plane-of-array irradiance. Although the pyranometer measuring plane-of-array irradiance is mounted at the same angle as the PV panels and is measuring the irradiance the panels are receiving, both pyranometers are being used to monitor the system. Top pyranometer is measuring plane-of-array irradiance. Bottom pyranometer is measuring global horizontal irradiance. The data from the SP-110 sensors allow the integrator to see when irradiance measurements for the PV panels are below the accepted threshold to maintain the PV system. 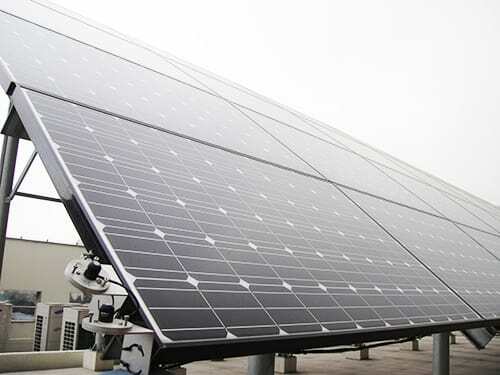 They are then able to use the data from the pyranometers and other instruments that are providing panel temperature, current, and voltage data to investigate the system and fix or replace bad electronic parts and PV panels. Apogee Instruments SP-110 Silicon-cell Pyranometers collect global horizontal irradiance and plane-of-array data to monitor the PV system at Jin Jeop Library in Korea. 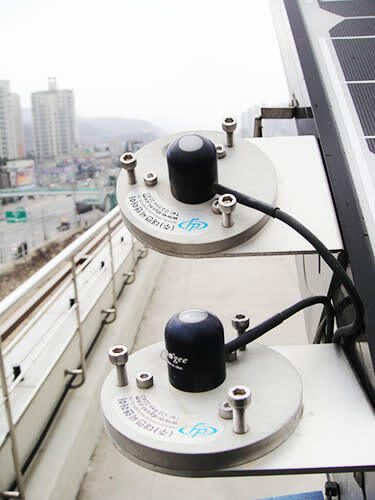 SP-110 Silicon-cell Pyranometers are integrated as part of a PV monitoring system for a PV power generation facility on the roof of the Jin Jeop library in Gyunggido, Korea.